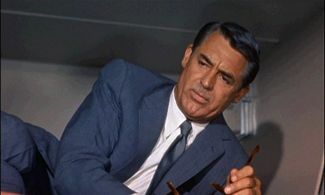 Cary Grant as seen in North By Northwest. Archibald Alexander Leach (January 18, 1904 – November 29, 1986), better known by his screen name, Cary Grant, was an English film actor. With his distinctive Mid-Atlantic accent, he was noted as perhaps the foremost exemplar of the debonair leading man, not only handsome, but also witty and charming. He was named the second Greatest Male Star of All Time of American cinema by the American Film Institute. When he was awarded his Oscar for Lifetime Achievement, it was in recognition of his all around brilliance. For many, he was the quintessential urbane and sophisticated man, although he began his career as a dancer and occasional juggler. He acted so effortlessly that some have suggested that he did not receive an Oscar during his screen career simply because he made it look so easy! While he was unlucky in his personal life, his on-screen persona gave pleasure to millions. Describing his own life as a "glorious adventure," he spoke of accepting responsibility for his own mistakes rather than blaming others. The lesson that he learned from his own career as a popular and much admired actor was that, in the end, acquisition of wealth and fame is no substitute for love, "the ability to fully love or to be fully loved." He did not enjoy speaking in public about his private life, yet on rare occasions he did so with honesty and candor. His recognition that he acted because he craved the love is a sad reminder that too many of those who give us pleasure on the screen have a similar and often unfulfilled hunger. The film industry sometimes comes close to destroying the lives of the people from whom it earns so much profit. 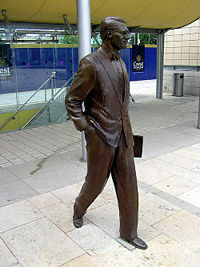 Archibald Leach was born in Horfield, Bristol, England. An only child (although he did have an older brother who died in infancy before Leach was born), Leach had a confused and unhappy childhood. His only true enjoyment in life was the Saturday afternoon movies. He dreamed of being on stage and having his name in lights. His mother, Elsie, was placed in a mental institution when he was nine. His father told him that she was dead, and he only learned in 1935 that she was still alive and still in an institution. This left Leach with an insecurity in his relations with women and a secretiveness about his inner life. These insecurities, by his own admission, led him to crave applause and attention and to create a new persona that would attract it. He had difficulty in school and eventually, in 1918, he joined the Bob Pender stage troupe. He traveled with the troupe to the United States in 1920 for a two-year tour. When the troupe returned to England, Leach decided to stay in the United States and continue his stage career. Still as Archie Leach, he performed on the stage at The Muny in St. Louis, Missouri, in such shows as Irene (1931), Music in May (1931), Nina Rosa (1931), Rio Rita (1931), Street Singer (1931), The Three Musketeers (1931), and Wonderful Night (1931). After some success in light Broadway comedies, Leach came to Hollywood in 1931, where he acquired the name Cary Grant. Grant starred in some of the classic screwball comedies, including The Awful Truth with Irene Dunne, Bringing Up Baby with Katharine Hepburn, His Girl Friday with Rosalind Russell and Arsenic and Old Lace with Priscilla Lane. These performances solidified his appeal, and The Philadelphia Story, with Hepburn and James Stewart, presented his best-known screen role: C. K. Dexter Haven, the charming if sometimes unreliable man, formerly married to an intelligent and strong-willed woman who first divorced him, then realized that he was—with all his faults—irresistible. Grant was one of Hollywood's top box-office attractions for several decades. He was a versatile actor, who did demanding physical comedy in movies like Gunga Din with the skills he had learned on the stage. Howard Hawks said that Grant was "so far the best that there isn't anybody to be compared to him." Grant was a favorite actor of Alfred Hitchcock, notorious for disliking actors, who said that Grant was "the only actor I ever loved in my whole life." Grant appeared in such Hitchcock classics as Suspicion, Notorious, To Catch a Thief, and North by Northwest. He could also be generous and once gave $100,000 his entire salary for a film, specifically for Arsenic and Old Lace (1944) to the United States War Relief Fund. Grant's first wife was actress Virginia Cherrill. They married on February 10, 1934, and divorced just over a year later on March 26, 1935. After becoming a naturalized United States citizen in 1942, he married wealthy socialite Barbara Hutton, becoming a surrogate father and lifelong influence on her son, Lance Reventlow. When he and Hutton divorced in 1945, Grant refused to accept a money settlement from her and they remained friends. Grant remained close to Lance, often referring to Lance as his own son, and was devastated when he was killed in a plane crash. Grant's third wife was actress and writer Betsy Drake. This was his longest marriage (December 25, 1949–August 14, 1962). His fourth marriage, to actress Dyan Cannon, on July 22, 1965, in Las Vegas, resulted in the birth of his only child, Jennifer, when he was 62. The marriage was troubled from the beginning (Grant was 61 and Cannon was 28), and they separated within 18 months. The divorce, finalized on May 28, 1967, was bitter and messy, and the custody disputes over their daughter went on for years. Grant married British hotel PR agent Barbara Harris (47 years his junior), on April 11, 1981, a marriage which lasted until his death. Grant did not enjoy talking about his private life. However, in his autobiography he gives deep insight into his own psychology, including his life-long desire to love and to be loved. He wrote that he chose his career out of a desire for adulation, affection and even for love, observing that all of everyone desires love even if they try to hide this from others. In the mid-1950s, Grant formed his own production company, Grantley Productions, and produced a number of films distributed by Universal, such as Operation Petticoat, Indiscreet, That Touch Of Mink, and Father Goose. While Grant was nominated for two Academy Awards in the 1940s, he was denied the Oscar throughout his active career. He was considered a maverick, as he was the first actor to "go independent," effectively bucking the old studio system, which almost completely controlled what an actor could or could not do. In this way, Grant was able to control every aspect of his career but at the cost of an Academy Award during his active career. Grant finally received a special Oscar for Lifetime Achievement in 1970. In 1981, he received the Kennedy Center Honors. In the last few years of his life, Grant undertook tours of the United States with "A Conversation with Cary Grant," in which he would show clips from his films and answer audience questions. It was just before one of these performances, in Davenport, Iowa, on November 29, 1986, that Grant suffered a stroke and died in the hospital a few hours later. He also took part in an experimental psychotherapy program during which he was prescribed LSD. He was encouraged to reflect on his failed marriages during the 100 experimental sessions. His autobiography explains that he found this beneficial and that he blamed himself, not Hollywood, for his break-ups. In November 2004, Grant was named "The Greatest Movie Star of All Time" by Premiere Magazine. Ian Fleming stated that he partially had Cary Grant in mind when he created his suave super-spy, James Bond. In fact, Sean Connery was selected for the first James Bond movie because of his likeness to Grant. Likewise, the later Bond, Roger Moore, was also selected for sharing Grant's wry sense of humor. ↑ Cary Grant,Archie Leach. Retrieved May 17, 2007. ↑ Cary Grant, Archie Leach. Retrieved May 17, 2007. Johansson, Warren, and William A. Percy. Outing: Shattering the Conspiracy of Silence. San Francisco, CA: Harrington Park Press, 1994. Nelson, Nancy. Evenings With Cary Grant: Recollections in His Own Words and by Those Who Knew Him Best. New York: Citadel Press, 2002. All links retrieved January 16, 2017. Carygrant.net—fan site with filmography and an autobiography. "The Man From Dream City" by Pauline Kael. This page was last modified on 16 January 2017, at 17:36.